Breyers ice cream has always been a long time family favorite, when I was a kid it was the ice cream brand I remember most being in our freezer. It wasn’t until I was older that I learned that my grandfather (my Dad’s dad who I never met because he passed away before I was born) worked fro Breyers in the 1950’s along with my Uncle Bruce’s Dad who was the CFO when the ice cream was produced in Philadelphia Pa. I remember stories my Dad used to tell me about how as kids he got to be the taste tester (along with the kids of the other people who worked there) for new flavors that Breyers was introducing. Breyers has partnered with chef Antonia Lofaso to create 5 fun, family-friendly recipes featuring Natural Vanilla to encourage family moments together and when they reached out to me about recreating one of the recipes not only can I not say no to anything involving a reason to eat something tasty, but it lined right up with my family’s love for the brand that we hear stories about all the time from my dad. 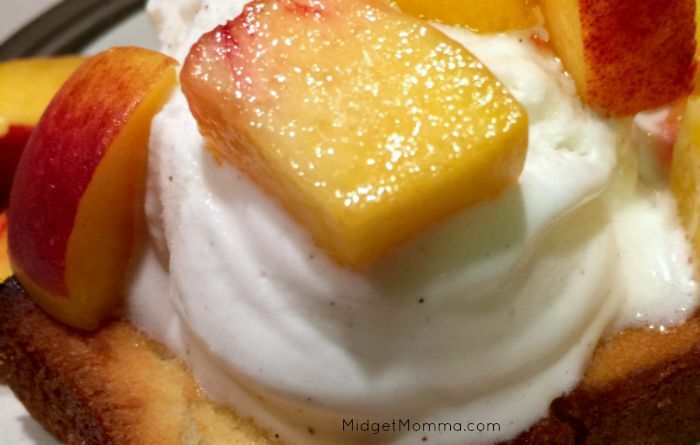 A little bit of seeing what my dad did as a taste tester as a kid, I got to do with my kids when we recreated the pound cake and peaches sundaes. 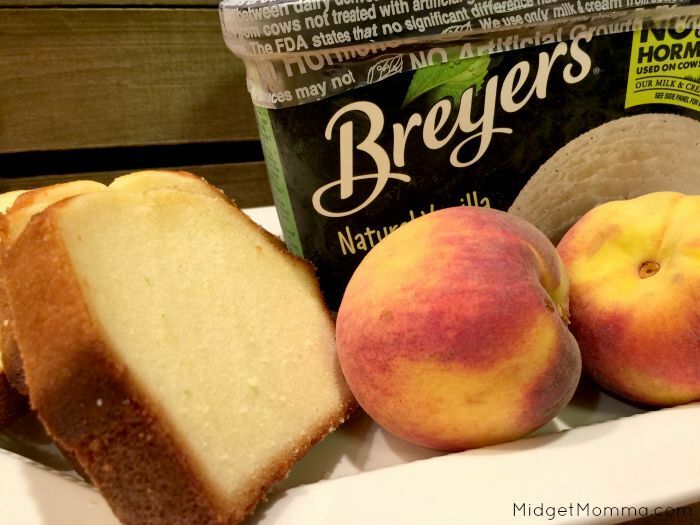 To make each sundae, place a slice of toasted pound cake on a plate, then top with a 1/4 cup scoop of Breyers® Natural Vanilla Ice Cream and cover generously with macerated peaches. Unfortunately for us none of my grocery stores had any fresh basil, which I was quite bummed about however the whole family LOVED the Pound Cake and Peaches Sundaes and I bet they are even more amazing when you add the basil to it. 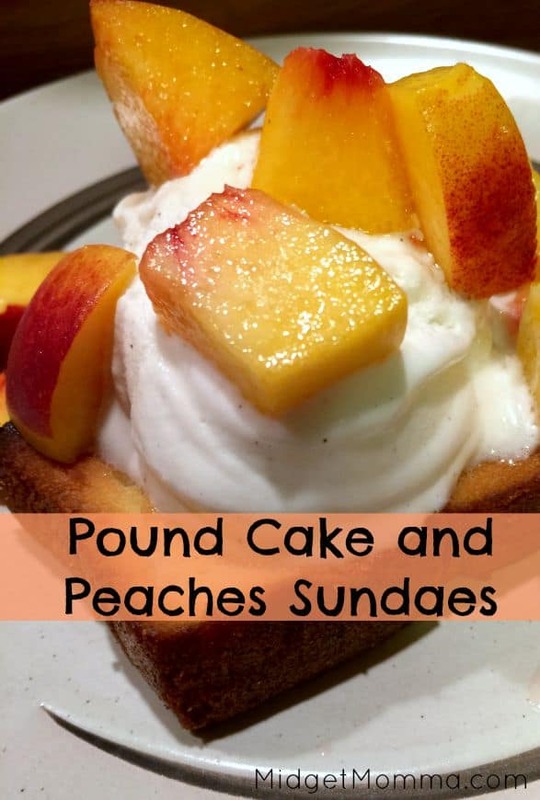 The flavors are amazing when mixed together and you can not beat a sundae with pound cake involved! 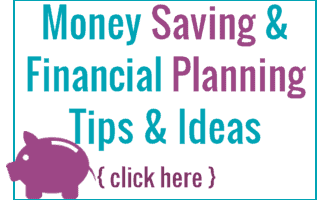 Follow Breyers on Pinterest, Breyers on Twitter and Breyers on Facebook. * Disclaimer: Suppliers of other ingredients such as cookies, candies & sauces may not be able to make this pledge. The FDA states that no significant difference has been shown between dairy derived from rBST-treated and non-rBST-treated cows.